Wed, Feb 6, 2019, 10:23 am SL Time, ColomboPage News Desk, Sri Lanka. Feb 06, Colombo: The Bank of Ceylon's "ABC of BOC" Annual Report for 2017 was recognized as the Winner of the Best Presented Annual Report Award in the Public Sector Banking Institution Category at the South Asian Federation Accountants (SAFA) Awards Ceremony held in Pune, India recently. 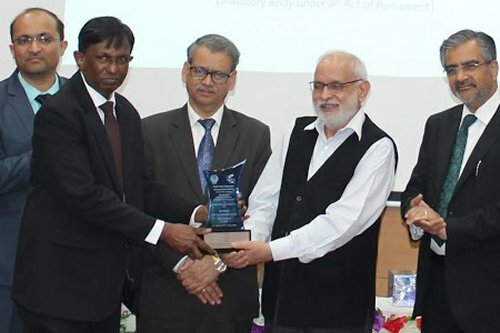 The Bank's Deputy General Manger- Finance and Planning Mr. Vipula Jayabahu received the award from Dr. Asok Josh- the Director General of Indian Institute of Cost and Management Studies and Research. "SAFA Awards" recognizes organizations in the region that achieved standards of excellence in accordance with the framework stated by the International Accounting Standards Board (IASB) in preparation of financial statements. Awards are presented in several categories which are: public sector banking institutions, private sector banking institutions, insurance sector, financial services sector, manufacturing sector, communication and information technology sector, services sector, non-governmental organizations and agricultural sector. This is the third time "ABC of BOC" won an Award with significant recognition. The Bank won three Gold Awards at the 32nd annual celebration of the World's best annual reports- International ARC Awards 2018 held in Germany, organized by the MERCOMM INC and the 54th Annual Report Awards Ceremony organized by Chartered Accountants of Sri Lanka once again recognized Bank of Ceylon as the Gold Award winner in the State Bank Category. Commenting on the achievement, the Bank of Ceylon's CEO/ General Manager-Mr. Senarath Bandara stated "As a prudent Bank, BOC always maintains its financial reporting standards to comply with the standards set by regulatory bodies and international reporting guidelines for financial institutions such as banks. They include and are not limited to reporting standards such as International Integrated Reporting (IIR) framework issued by the International Integrated Reporting Council and G4 guidelines issued by the Global Reporting Initiatives (GRI) for sustainability reporting. Being a public owned Bank that has maintained a steadfast excellent record of reputation throughout its 79 years in the banking industry, transparency and accountability in our business matters very much. We ensure that we maintain all our reporting at the required standards that they represent the manner we maintain our reputation and integrity."